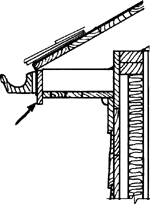 A strip nailed along the eaves of a building to raise the end of the bottom course of tile or slate on the roof. Tenders are invited for Repair Of Eaves Board, Gutters, Damaged Flooring Of Store, Repair Of Bathrooms, Repair Of Wornout Glazed Windows And Wire Gauge Shutters, Chain Link Fencing At Backside, Staging And Caging Of Pvc Water Tank, Fencing And Other Miscellaneous Work At Fitzroy Villa in connection with M/R To Defence Pool Bunglows Under Bemloe Section At Shimla H.
Limited Tenders are invited for Provision Of Vertical Eaves Board Arrangement For Canopy In Front Of Collapsible Doors And Covering Of Gap In Wall Cladding To Prevent Rain Water. S Sheet Eaves Board In Shivalik And Himadri Blocks. Tenders are invited for Provision Of Chequerred Tile And Railing Infront And Repair Of Gutters Eaves Board And Rain Water Pipes For Military Barrack No:2 At Iias, R.
Tenders are invited for Repair and replacement of leaking roof, false ceiling, womout eaves board, railing womout outer dhajji walls, wornout doors and windows and other miscellaneous repair works for Longwood-26 in connection with Special repair to GPRA at Long wood.